With both Waldorf MD home prices and mortgage rates increasing this year, many are concerned about a family’s ability to purchase a major part of the American Dream – its own a Waldorf MD home. However, if we compare Southern Maryland housing affordability today to the average affordability prior to the housing boom and bust, we are in much better shape than most believe. On the other hand, wages have risen over the last twenty years. Black Knight’s research revealed that, when comparing “the share of median income required to buy the median-priced home” today, to the average between 1995 to 2003, it is currently more affordable to purchase a home in 44 of 50 states. 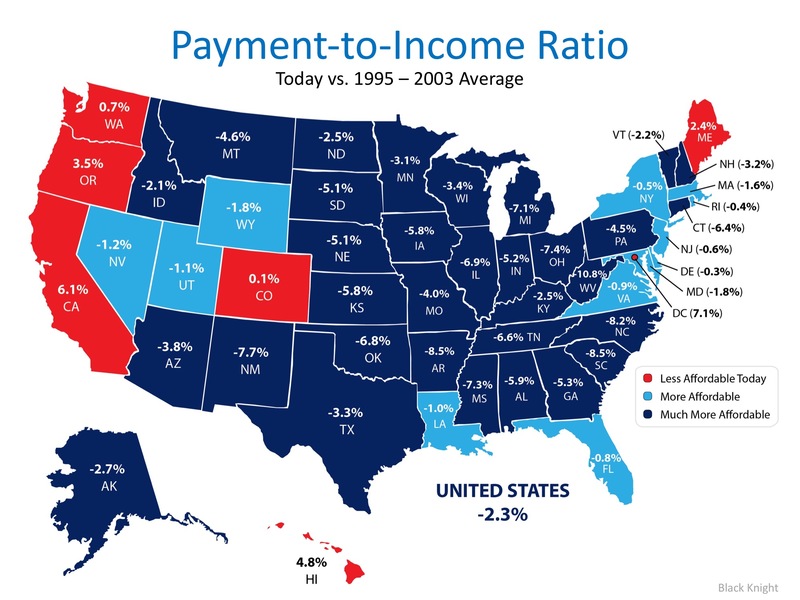 Here is a state map of the percentage change in the price-to-payment ratio. Positive numbers indicate that it is less affordable to buy a Waldorf MD House while negative numbers indicate that it is more affordable. If you take a look at Real Estate in the State of MD, you will see that our area of Southern Maryland and Waldorf MD has decreased by -1.8%. Meaning that Homes for Sale in Waldorf MD and in Counties like Anne Arundel, Charles County, Calvert County, Prince Georges and St. Mary’s County. Whether you are moving to the Waldorf MD and looking for the home of your dreams or purchasing your Waldorf MD first house, it is a great time to buy a house in Waldorf MD when looking at historic affordability data. You always have the choice of Buying a New Home from Caruso Homes. Whether its in one of our many communities or buying from the On Your Lot division. We here at Caruso Homes will build one of our community homes in the Waldorf MD area. We have several homes on the market now for you to purchase. Please contact Skip Young Real Estate from Re/max 100 to find out more details. If you are planning on buying and/or selling a Waldorf MD home this year, let Waldorf MD Relator Skip Young get together to help you navigate the conditions in our Southern Maryland market and set you up for success. Covering Charles County, St. Mary’s County, Anne Arundel County, Prince Georges County and Calvert County. To Be Built on this lot, 9 Months New Michigan 2376 Sq Ft on this 1 acre lot in Waldorf MD. This home site in Waldorf MD To Be Built by Caruso Homes On Your Lot Division. Different Elevations to choose from. This package offers 3 level living with basement, 4 Bedroom, 2.5 Baths 2 car Garage, Siding Standard, Brick if you choose up-grade, Kitchen with Stainless Steel Appliances. With the 1 acre lot it will allow you to build a much larger Michigan or anyone of our many Caruso Classics. North Point High School District is a school for career and technology education (formerly science, technology, and industry). It is located in the far western area of Waldorf, Maryland, United States. At 311,000 square feet (28,900 m2) and with about 2,200 students enrolled, it is the largest high school in Charles County. It is also the second newest high school, having opened in 2005. Its mascot, the Eagle, was derived from the motto of Charles County, “The wild side of the Potomac… Where eagles soar! North Point has 17 career and technology education programs (formerly as STI for science, technology and industry). An estimated half of the student body is enrolled in one of these programs, while the other half receives a normal high school education. Find out your Homes Value in Waldorf Maryland today by filling and submitting the form. Whats my House Value in Waldorf Maryland? If you are looking to Buy a Home in Southern Maryland, hire a Southern Maryland Realtor to help you find the Home you are looking for. In either Charles County, St. Mary’s County, Prince Georges County, Calvert County or Anne Arundel County, Finding and Hiring a local Realtor will help you find the right home for the right price. If its New Construction you need, your local Maryland Realtor can help you find the right Community or even find the right On Your Lot with Caruso Homes to build your Luxury Dream Home. What is your house value. Home value comes from the sales of other properties in your community that have sold over the last 6 months. When your house is prepared to go on the market, the value is calculated by Bedrooms, Bathrooms, Square Footage, Garage and Basement. Location also plays a part in the value of your home. If your in a good location, close to shopping, in a great school district, this will attract more potential buyers to your home. Making the home value much higher and also opening up the possibility of selling your home much faster. Taking also into the factor that when buying a New Luxury home from Caruso Home – On Your Lot, you have the opportunity to get your new home built for less than regular market value. Always give New Construction of your purchase a chance to see if you have the 7 – 9 months of build time. Caruso Homes also has communities all around Maryland that have homes that are 30 – 45 days out for you to purchase as well. Buying new will give you the value and equity to grow in your investment. Need to know the value of your Waldorf MD? Please leave a message below and I will return your homes valuation, time to sell on the market and any other information on your neighborhood statistics. Sold a Single Family home in 2010 in Mechanicsville, MD. I tried unsuccessfully for four years to sell my home in Mechanicsville. Two different real estate companies declined to renew my listing. Thank goodness for Skip Young. He never gave up and never made any excuses – and this was at a time when the real estate market was at it’s absolute worst. We had some offers that fell through at the last minute. Skip never wavered. His attitude was always positive. Thanks to Skip’s tenacity and professionalism my house sold and I got the fresh start I needed. Thank you Skip. Buying or Selling Real Estate in Maryland, Servicing these area’s. Priced To Sell Immediately (PTSI)?